The use of Reliance Jio SIM cards as India's primary network for voice calls increased in 2018, said a UBS report. About 92 percent of Jio subscribers used the network for voice calls during December 2018-January 2019, as compared to 83 percent in March-April of the same year. The ‘Evidence Lab’ survey by UBS reports that there is a decline in multi-SIM ownership in India, but smaller towns are more on the radar than the large metros. For example, fewer subscribers are changing their primary SIM now, as compared to 3-12 months ago, especially in metros, the report said. On an industry level, the survey shows a material reduction in multi-SIM ownership from 1.33x to 1.22x for March-April 2018 and December-January 2019, and among smartphone users, this is down from 1.5x to 1.36x. 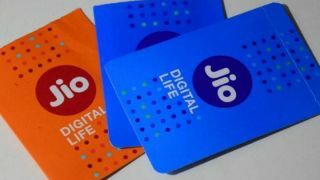 “The results also show a large proportion of Jio users are now using it as primary voice Sim, which we believe is essential for eventual stabilisation of competitive and pricing environment – we see it highly unlikely that operators can raise prices in an environment of high multi-Sim ownership,” it said. Also, customer satisfaction levels are comparable across the three main operators in metros, which should drive stability in competitive dynamics. But in non-metros, customer satisfaction levels with Bharti and Vodafone-Idea (VIL) still trail Jio, and consumers here are more likely to switch their primary SIM carrier than in metros. This, perhaps, opens up another opportunity for Jio to gain market share while Airtel and VIL are busy catching up on their 4G network coverage. The study also revealed that Airtel is steadily increasing its share of subscribers; VIL is losing its share; Jio is maintaining the same. “Indeed, incidence of Airtel's Sims being used as primary data Sim is now almost comparable to Jio, signalling that the company is starting to succeed in its strategy of becoming the primary 4G Sim slot among its 4G subscribers,” said the report. The report also said that JioPhone's share among feature phone users in India had dropped to 11 percent of the total Jio subscribers during the period under review, as compared to 17 percent during March-April 2018. JioPhone's momentum has room for growth in non-metros; however, it also added that customer satisfaction levels with JioPhone are higher than other feature phone users. The survey was conducted from December 15 to January 21, by face-to-face interviews of 2,120 mobile service users across 13 cities.The cities surveyed were New Delhi, Mumbai, Bangalore, Kolkata, Nagpur, Patna, Vishakhapatnam, Jodhpur, Udaipur, Alwar, Salem, Raipur and Allahabad.